In this guide we’ll take a look at the best lawn mowers for the UK market. What Is The Best Lawn Mower For The Money? The Bosch Rotak 40 Ergoflex is a bit of a beast and takes electric mowers to the next level! At 1,700 watts, this engine makes this the best lawn mower around. It’s got a 40cm steel cutting blade, a cutting height range between 2cm and 7cm, and a big 50 litre grass collection box. In fact, it boasts a 99% collection rate for the neat freaks among you! It’s got what Bosch call ‘extended grass combs’ to help you get right up to the edge of your lawn, and of course an integrated rear roller if you want the striped effect. The Rotak 40 boasts a really well designed handle. It’s nice and chunky and has good grip. There’s been real thought into user posture, and reducing muscle strain which doesn’t go unnoticed. With all these features, it’s no surprise this mower wins first spot as the best lawn mower for the money! I’m a big fan of the Hyundai HYM510SPE– it’s one hell of a petrol lawn mower. If you’re garden is on the medium to large size, you definitely need to consider it. Firstly, let’s talk power. It comes with a 173cc 4-stroke petrol engine with low fuel consumption. For those that don’t know much about lawn mower engines – it’s a beast! And as we’ve said many times, more power means a better cut. Next, and unlike most lawn mowers on our list, this mower is self-propelled. Essentially this means you don’t have to push it. So if you’ve got steep inclines or uneven areas of your garden, it’s really useful. It’s fitted with a speed controller, and an option to push, giving you total control over it. Other features include a massive 51cm cutting width, a wide cutting range of 2.5cm to 7.5cm, and a very large 70 litre grass collection bag. Everything about this mower screams BIG! And as if all these featured weren’t enough, it can mulch and discharge your clippings too helping improve the health of your lawn. Overall, this is a fantastic lawn mower and will make mowing a big lawn much easier! The Flymo Speedi-Mo 360C has become a favourite with homeowners over the last few years. It gives a great finish to your lawn, it’s reliable, and it won’t break the bank. But if you need further convincing, here’s a few more reasons why you should consider it. Firstly, it’s got very good power behind it at 1,500 watts. Combine this with it’s lightweight body (just 11.5kg) and you’ve got a mower that’ll glide around your lawn with ease. Flymo also give you a good cutting height range from 2cm – 6cm, based on your preference or how short you like to go at different times of the year. Now it may not be cordless like some of the others options on our list, but Flymo don’t scrimp on the cable length like some other manufacturers. You’ve got a good 12m to work with, where others often give you just 6-10m. It’s got a decent sized grass collection volume of 40L, which isn’t range-beating, but it does compact very well. And lastly, I’ve got to comment on the price. It’s very competitive, especially considering the spec of the model. So if you’re looking for a lawn mower that isn’t silly money, but cuts your grass perfectly and is easy to move around, you should certainly consider this one. I’m a big fan of the Bosch Rotak range, and the cordless Rotak 32 is a top model. It’s not until you use one of these babies, that you realise how much a cordless lawn mower frees up your movement. It’s a flagship model that is one of the best cordless lawn mowers for on the market. Now it’s important to note that it’s designed for medium sized gardens; up to 150m² Bosch say. Just like a BMW i3 won’t get you from London to Manchester, the cordless Rotak 32 won’t cover acres of estate, but for the majority of us, this isn’t an issue! It comes with a 32cm cutting width, 3cm to 7cm cutting height range, and decent 32 litre grass collection box. It’s powered by an innovative little 36 volt lithium-ion battery. For ease of use, the battery has 3 LED lights to indicate how much life is left, and takes about 45mins to an hour to fully charge. As you’d hope from a battery powered mower, it’s much quieter than electric or petrol. It’s also relatively lightweight at 13kg, with folding handles for easy storage. The question is, is it worth money because cordless lawn mowers aren’t exactly cheap. The general consensus among owners is ‘yes’ – you get what you pay for, and the mowing experience is far nicer. This is the best cordless lawn mower for the money and it works a charm! The Flymo Easi Glide 300 is the only hover lawn mower to make my list; but it’s more than earned its place. This is such a popular model, and many users claim its by far the best electric lawn mower that is both high quality and affordable. For such a lightweight unit (only 8.8kg) it doesn’t half pack a punch with a 1300 watt motor. It’s got a strong 30cm metal cutting blade, and 20 litre grass collection box. Although this is on the small size, it actively compacts the grass, and is perfectly fine for gardens the size of half a tennis court or smaller. As hover mowers are closer to the ground, they are great if you prefer very short grass. The Easi Glide 300 comes with 4 cutting heights ranging from 1cm to 3cm. To make things even easy, it comes fully assembled out of the box. And in terms of storage, the handle bars fold right over keeping it very compact. This lawn mower performs great and it offers amazing value for money. It’s a winner for the best lawn mower on a budget. If you’ve done any research on robotic lawn mowers, you’ll know that the majority aren’t without their issues. Whether it’s struggling with tough terrain, or a lack of customer support, most brands are falling short at the moment. Flymo aren’t most brands though. The Flymo lithium-ion robotic lawn mower 1200R has been brilliantly received, and is a major breakthrough for the robot lawn mower market. It copes well with rough ground, obstacles, and even rain. And, it moves slowly with the blades tucked well underneath, so doesn’t pose a risk to wildlife. It’s extremely quiet, and great for you garden as it mulches as it goes. This distributes the tiny grass clipping back to your lawn to feed the soil. A full charge will send this little chap on his way for 60 minutes, and when the battery is running low, he’ll simply report back to his charging station to refuel! It can cope with areas up to 400m², so medium to large gardens or orchards are perfectly fine. If you want to relax on the sofa on Sunday afternoons instead of cutting the grass, this is the best lawn mower for you! If don’t like the faff of a bulky lawn mower, or simply want something cheap that’ll deal with a small lawn, the Einhell GC-HM 30 is a great choice. It’s incredibly lightweight at just 7.4kg, cuts at a width of 30cm, and has a good cutting height range of 1.5cm to 4.2cm. The grass collection bag can handle up to 16 litres, and the beauty of course is that you can see when it’s full! The cylinder itself is constructed of 5 rotating blades that’ll chomp through your lawn with ease. Overall, if your lawn is quite small and you like the idea of a bit of mowing exercise on a saturday morning, this is a great option. These are your good old-fashioned push lawn mowers! As drive it forward, it rotates the cylinder blades and cuts the grass. They’re a great alternative to your traditional lawn mower, and they’re a lot cheaper too. If you have a small garden, hand push might be the best option for you. Simple to use, very lightweight, and easy to store. You may be surprised to know that the hover mower was invented in 1964! A clever technology that uses air to create a cushion between the grass and your mower. This enables the high speed rotary blade to cut your grass. Because hover mowers can be maneuvered from side to side, they’re great for getting under awkward evergreens and overflowing borders. However, as I’m sure you’ve experienced at some point, the feeling of moving a hover mower side-to-side isn’t the most natural. It takes a fair amount of forearm strength, so just make sure the hover mower you choose isn’t too heavy. As you might expect, the most common of the lot is the electric lawn mower; perfectly capable of dealing with small to medium sized lawns. It comes in all different formats (rotary, cylinder, hover) and is the best solution for the majority of British gardens. If you’ve got a big garden, you’ll know the struggles of dealing with the cable or extension lead. If it’s not continually having to throw it out of the way, it’s trying to reach those final 3 feet as the cable pulls you back. These are the next generation of lawn mowers. Simply plug them in, charge them up, and away you go. No cables, no petrol, no pollution. They’re fantastic. But what’s the catch?! Well, just like an electric car is only really good around town, a battery powerful lawn mower is only really good for about half an hour. That being said, for the majority of gardens this is more than enough. A cordless lawn mower makes the best lawn mower for a small garden because of how easy they are to use! As a general rule with lawn mowers, the more powerful they are, the better the cut. And petrol mowers are where you can start having some fun! Of course they need a bit more care than your standard mower, but it’s certainly worth having the right tool for the job, especially if you’re dealing with a large garden. For my advice on the best petrol lawn mower for larger gardens, follow the link. If you thought battery powered mowers were a neat idea, you ain’t seen nothing yet! If you’ve got the money, the future is at your fingertips. After defining the area you want it to cover, it simply travels it, cutting and mulching as it goes. You’re on the patio enjoying a BBQ, while this little fella does the donkey-work! Check out our guide to the best robot lawn mowers here. What lawn mower is best for my garden size? 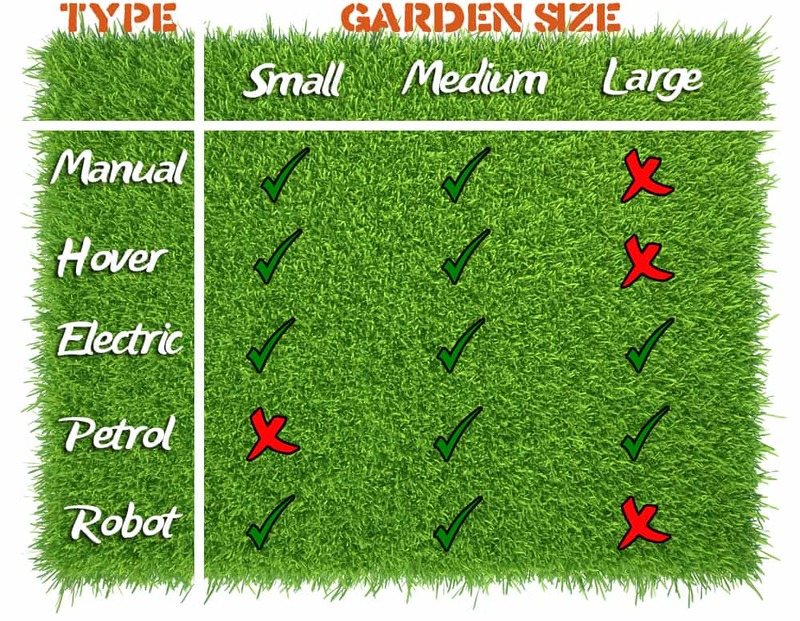 In the handy table below, I’ve highlighted which lawn mowers are appropriate for different sized gardens. This should help you in choose what’s best for yours. How much does the weight of a lawn mower matter? Lawn Mower weight is certainly something to consider before you buy, and there’s quite a difference. 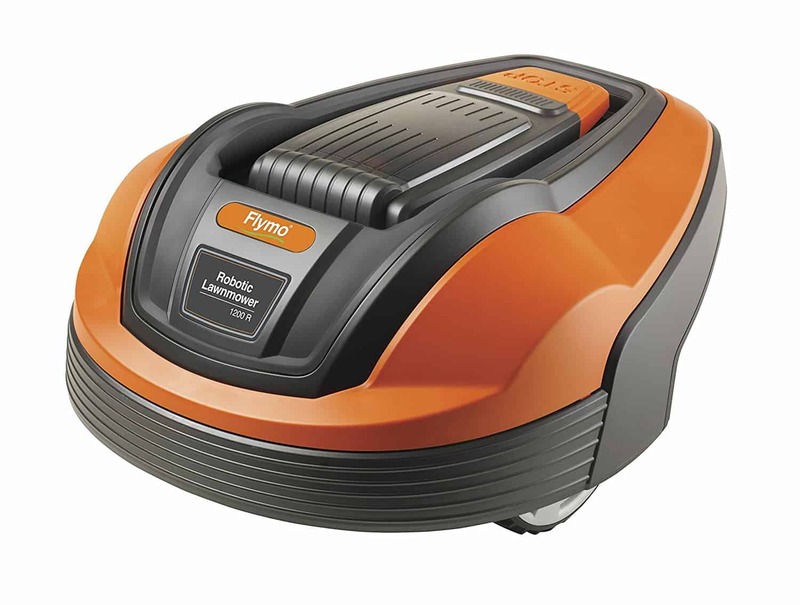 They can range anywhere from about 7kg for push or hover mowers, all the way up to 40kg for a beastly petrol one! Ultimately, you need something you’ll feel comfortable manoeuvring. Should I buy a self propelled lawn mower or a push lawn mower? Self-propelled mowers are best suited for big lawns and steep inclines. Basically, the do the hard work for you. If you’ve got a small or medium sized garden, that’s generally flat, you don’t really need self-propelled. If you’re dealing with a big, uneven garden, you’ll really appreciate self-propelled! What is mulching and do I need it? Mulching is a great little feature to consider for your next lawn mower, unless you own a garden shredder, which of course is also great for mulching. After the initial blades of grass are cut, they are transported into the mower. Once inside they are finely cut down into very small particles of grass. These particles are then distributed back to the lawn where they can quickly decompose, and feed the soil with valuable nutrients. This makes your soil richer, which in turn makes your grass healthier. There are other useful benefits to mulching too. Firstly, you’ll save a lot of time having to empty the grass collection box. Secondly, you’re helping the environment by not having to throw away tons of grass every year. And thirdly, you won’t have to bother with harmful pesticides and weed killers, because you’re treating your lawn the natural way. How important is cutting height? Interestingly (or perhaps not so interestingly), cutting your grass at certain lengths can affect the health of it. For example, when it’s colder, cutting your grass as high as possible is good for it. When it’s warmer, cutting lower can help get rid of dead blades. For the majority though, it’s personal preference. A beautiful, thick green lawn can look amazing, whilst a really short one is great for playing football on. The choice is yours, and of course most lawn mower manufacturers give you the option. Typically the better the lawn mower, the more cutting heights you’ll have. Most cheap lawn mowers will have 3 options, mid-range mowers have about 5 or 6, and high-end models can have 7+. What size grass collector do I need for my lawn mower? Grass collectors range from about 20 litres to 80 litres. As you’d expect, the bigger your garden, the bigger your container should be. It’s also worth noting that they come in two formats; grass collector bags and grass collector boxes. The bags are typically made of canvas, while the boxes are made from plastic. In the plastic boxes, look out for plenty of air holes as good ventilation helps evenly distribute the grass. Canvas bags obviously do this well already. How important is the handle bar? With such focus on power and performance, it’s no surprise many people overlook comfort. If you’re going to be pushing this thing round for half an hour, you’re going to want something with a good grip and that dulls the vibrations. It’s also worth checking that the handle bar is adjustable too. Out of all our reviewed lawn mowers, the Bosch Rotak is the best lawn mower for both comfort and performance. It has the most user-friendly handle bars, with a chunky grip and well-positioned buttons. What is the cutting deck and does it matter what it’s made from? The cutting deck is the main body of the lawn mower. It safely houses the blade underneath, and ensures you’re protected from it. Cheaper lawn mowers generally have a plastic cutting deck, while higher-end models tend to be made from steel or aluminium alloy. Of course metal is stronger than plastic, but in reality plastic cutting decks are still very strong. Unless you’re going to transporting your lawn mower with other heavy-duty machinery, it’s not something you have to worry about getting broken. Which are the best lawn mower brands? There’s a reason why Flymo and Bosch dominate our top 10 lawn mowers. They’ve both perfected their models for the mass market, and understand the average consumer wants and easy to use, reliable lawn mower at an affordable price. Flymo has actually been around since 1964, with their iconic orange lawn mowers coming to market in 1977. Incredibly Bosch is over 130 years old! Although they specialise in a wide variety of appliances and equipment, they consistently deliver quality products. As I’m sure you know, their reputation is top-notch and they’re a brand to be trusted. Looking at the other manufacturers on our list, Einhell have been making garden tools for 50 years, VonHaus are a massive brand, and Evopower are making waves in the lawn mower market thanks to their modern technologies. How do I contact the manufacturer? Where can I find the manual for my lawn mower? We’ve been able to track down the majority of manuals for the mowers listed above. However, some don’t exist as online PDFs.